Chairs Page 1 In the Glasgow Style. See also George Walton and The Glasgow Boys. Chairs. Wylie and Lochhead. 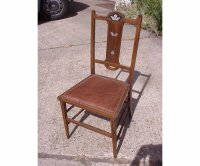 An Arts and Crafts oak side chair with inlaid details and heart cut out. Attributed to John Ednie. 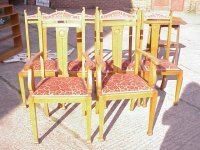 A set of six Arts and Crafts oak dining chairs with stylised floral carving to the backs with tapering square legs by Robson's of Newcastle. These are almost identical to the chairs below except they have slightly different feet. 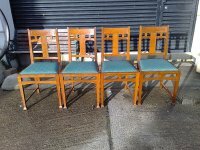 Set of four Arts and Crafts oak dining chairs with stylised carved floral backs. by Robson's of Newcastle. These are almost identical to the chairs above except they have slightly different feet. 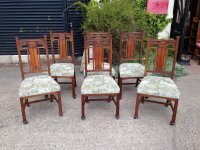 A set of four Arts and crafts oak dining chairs consisting of two side and two armchairs attributed to Wylie and Lochhead with stylised Glasgow Rose and floral carved details to the backs, professionally re upholsterd in a quality hide. 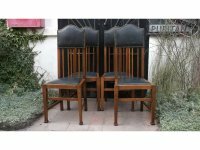 A set of twelve Glasgow style high back oak dining chairs consisting of two armchairs and six singles with leather padded head rests. 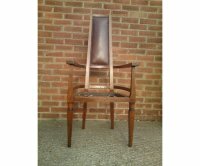 The last image is of the armchair and a single chair before they were professionally upholstered in a quality leather. I also have a spare armchair available to sell on it’s own. A good quality Glasgow School tub chair with stylised cut-out to the back and twin stretchers to the back and sides, one of the best examples of this design I have come across. 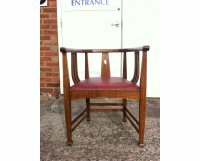 I have had this re upholstered in a quality burgundy hide. 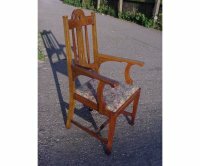 A stylish Arts and Crafts Glasgow style armchair with shaped back rest and finely turned uprights and stretchers on square tapering legs. Fully restored and professionaly re-rushed. 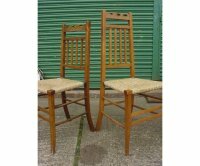 A pair of Glasgow School oak Arts and Crafts side chairs by Wylie and Lochhead with inlaid pewter florets to the top, original rush seats in very good condition with square tapering legs united by four stretchers. 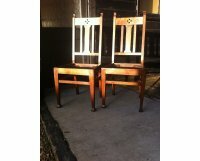 A pair of Glasgow School Arts and Crafts oak dining chairs by Wylie and Lochhead with stylised Square cut-outs to the head rest. Height of backs 41". Circa 1900. 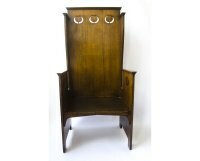 A good set of four Glasgow School Arts and Crafts oak dining chairs attributed to E.Punnet and probably made by William Birch consisting of two armchairs two singles, with stylised cut-outs to the head and angular back rests with shaped arms to the carvers and turned legs to the front with ring turned feet. 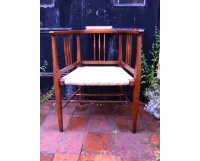 An excellent quality Oak armchair made by Goodhall, Lambs and Heighway of Manchester (stamped under seat rail). 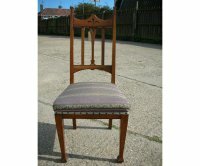 It has a superb stylised carved back spat and wonderful pierced sweeping arm support's. A good set of six Glasgow School oak dining chairs made by Wylie and Lochhead inlaid with Pewter and Ebony 'Fluer De Lys' Which translate to Flower Of The Lily. An Arts and Crafts Glasgow Style oak dining table by Wylie and Lochhead with square and turned legs united by side stretchers. Matches chairs below. 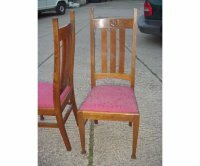 A set of six Glasgow style high back oak dining chairs with upper lattice details consisting of one armchair and five singles. 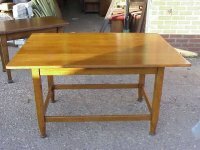 There is a matching dining table above which can be bought separately. I will sell the chairs seperately from the table. 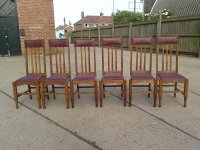 A set of five Arts and Crafts oak dining chairs with stylised cut-outs to the backs. 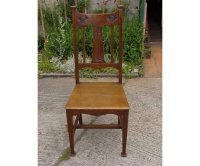 A top quality Glasgow school Oak Arts and Crafts hall chair attributed to Shapland and Petter in the manner of M H Ballie Scott with superb stylised floral carving to the back. 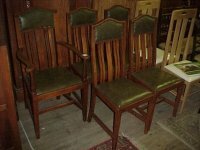 Set of four Oak Arts and Crafts dining chairs probably by Shapland and Petter. 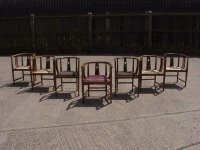 Seven Glasgow style tub chairs. A pair of Glasgow style armchairs, one restored and re upholstered in a quality hide and a single chair available. LAST ONE SALE PRICE £2000. 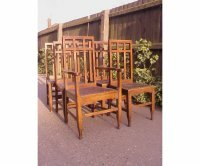 A set of four good quality Arts and Crafts oak dining chairs attributed to Wylie and Lochhead. An Arts and Crafts oak bedroom chair with floral inlays using Pewter and Ebony with string inlay throughout, professionally re-upholstered in a quality hide. Six rush seated chairs by Wylie and Lochhead in the manner of EA Taylor. 1 x High backed straight leg version. 5 x splayed leg versions, restored and re-rushed. 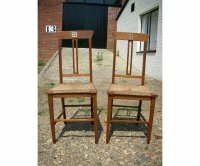 A set of six Arts and Crafts oak dining chairs with fabulous elongated tops with stylised floral and heart cut-outs. 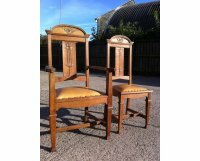 A good quality set of six Oak Arts and Crafts dining chairs by Wylie and Lochhead with curly top's and carved central circles on square tapering legs. 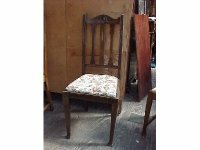 A good quality Set of five (one carver) Arts and Crafts oak dining chairs by Wylie and Lochhead, they have all been cleaned and waxed now and ready for upholstery. A picture of this chair is illustrated in the Wylie and Lochhead catalogue of 1901. 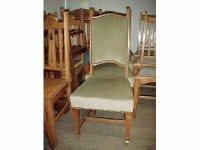 Set of five Arts and Crafts Oak dining chairs, with curved back splats making them a very comfortable chair indeed. One Carver four singles. Circa 1900. 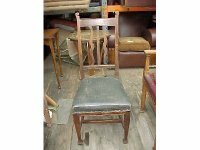 A good quality set of four Glasgow school Oak dining chairs made by Wylie and Lochhead. A picture of this chair is illustrated in the Wylie and Lochhead catalogue of 1901. A good Glasgow style oak armchair, attributed to JS Henry, restored, and ready to be professionally recovered, which we can provide. 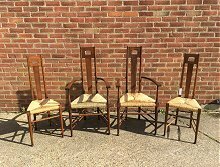 A set of four Arts and Crafts oak dining chairs with inlaid decoration to the back rests in the shape of a 'T', high front stretchers and low side stretchers. One stamped‘B49’. 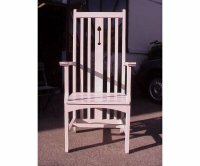 A white painted armchair in the style of Charles Rennie Mackintosh. 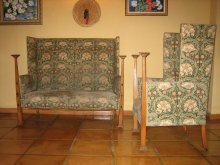 A good Arts and Crafts oak settee and matching armchair with capped uprights to the front inlaid with twin Hearts Ebony inlays and a Walnut Star inlay and further string inlay of Ebony and Satinwood retaining the original Morris and Co fabric. 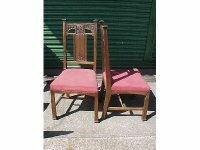 A pair of Arts and Crafts oak chairs designed by E A Taylor and made by Wylie and Lochhead with crisply carved Glasgow roses to the head rests shaped slatted backs tapering legs united by three high stretchers. 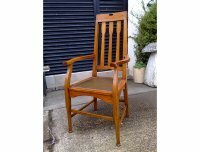 A rare and very progressive Arts and Crafts oak armchair in the pure Glasgow style, with planked sides and back pierced with a row of halo style cut-outs to the back and to the sides. This cut-out design is reminiscent of C R Mackintosh’s famous argyle chairs for Mrs Cranstons tearooms where the cut-out to the backs of those chairs were specifically designed to cast a halo upon the head of the persons seated. The very high back of these styles of chairs are so when a group is seated the high backs make it so much more private within a public place. This could have been designed by E A Taylor for Wylie and Lochhead in Glasgow, it also has a feel of Liberty and Co about it. A rare, probably unique very well designed armchair. Dimensions: H 57', W 26.5', D 21.5'.